There’s just no way around it. Dessert is where it’s at this week at our house. With Valentine’s Day, a special birthday, and Mardi Gras (make-up) we’re talking sweet treats galore. I’ll try to make up for it with the sweet-free days shaping up in the utmost of healthy, veggie-centric ways. Last week I was so excited about celebrating Chinese New Year, I missed Fat Tuesday entirely. 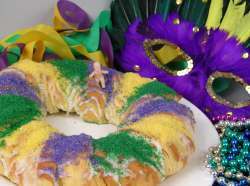 I’m not about to miss that holiday, so call it Fat Friday, and jump right into the Mardi Gras celebrations! This beautiful kale will shine alongside an everybody-loves red beans and rice dish at our mini Mardi Gras celebration. Pizza night will move to Valentine’s Day and star in a delicious heart-shaped affair. And the freshly foraged mushrooms are still coming – they’ll play a very special role indeed nestled within the best burger in town. As for the rest, take a look, join in where your palate is tempted; celebrate all that our amazing Northwest winter offers us. Saturday – break out the barby, quick! grilled steak – your style! This red beans and rice dish is a favorite way to get a little taste of New Orleans during Mardi Gras. I like to add winter kale to the pot, to make it a lovely one-dish meal. (If you’re a purist, just make a quick side of sauteed kale – works the same as the chard in this Bon Appetit recipe.) I prepare it a little differently than the recipe suggests. I would sauté the onion (I’ll use leeks), garlic and bacon together in a little olive oil first, then add a head of chopped kale just until it softens a bit. Proceed with the rest of the recipe, adding the liquids, bringing to a boil, and baking. The quick version would be to use canned beans (two cans) and just simmer on the stovetop until the flavors meld and it is the consistency you want. Be sure to offer an array of Louisiana hot sauces as well. Add a side of browned cajun chicken sausage links and famous New Orleans Abita beer, break out the beads, and we’ve got a Mardi Gras party! For an extra special ending, pick up a King Cake at any local bakery. With temperatures recently in the sixties, and a break in the downpours, it’s time to do a little grilling. I just couldn’t ignore the coincidence when ribeyes were advertised in the New Seasons flyer this week. It’s quite simple to pull together a dinner of “steak and…”. Nearly any vegetable I received this week would make a fabulous candidate for a side. Tonight I’m going steak and roasted carrots and a beet salad. Kale salad, sautéed leeks or mushrooms, a parsnip mash, or roasted delicata squash…any of these would prove divine with a grilled steak. The addition of a good balsamic vinegar over these roasted carrots make them extra yummy and perfect for a steak accompaniment. I’m also going to use my succulent beets as the base for a salad in which the blue cheese was just meant for steak night! Valentine’s Day is a family affair around here. We’ve all eaten 100 conversation hearts (and other unmentionables) by dinner time, but still look forward to celebrating the day about love, hearts, sweets, and all things red and pink! Pizza Night goes heart-shaped this week! 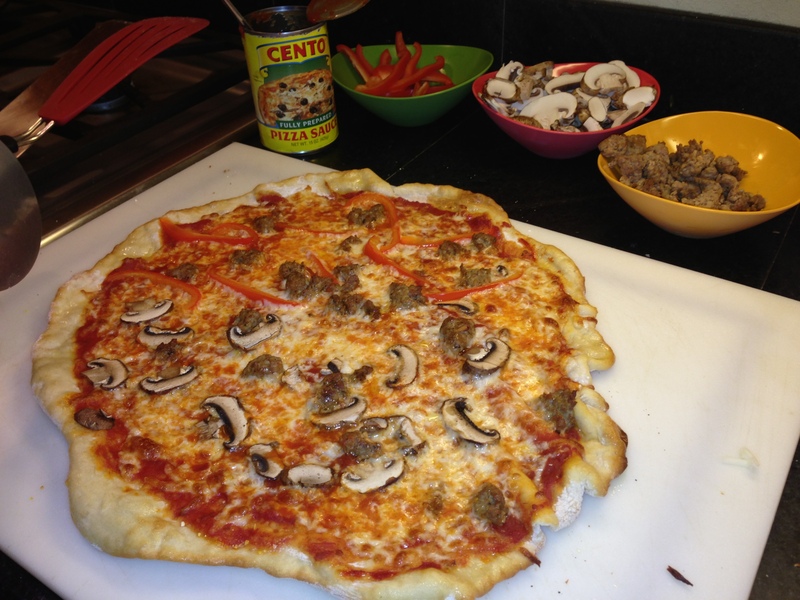 Let this prior post be your inspiration and step-by-step instructional to pizza made in your own kitchen. After rolling out the dough, roughly give it a bit of a heart shape – no need to be too exact. The Martha recipe is included only as a guide for the leek and mushroom preparation. I would double the quantities, knowing that I’m making at least two pizzas. Experiment with the cheeses -mozzarella, fontina, parmesan, chevre – they all sound amazing. You can have all of the toppings ready in an assembly line for do-it-youself fun! For dessert, hoping to make these festive, brilliantly hued cupcakes. Forget the food coloring; these get their deep magenta shade from pureed beets! Follow Diane’s simple guide for roasting beets, then toss them in a food processor. Her buttercream looks amazing, infused with pure orange oil. But if time gets tight, frosting from the can wouldn’t be the worst thing. Finish with Valentine’s sprinkles! On this day that we honor our American presidents, I thought it fitting to read a little about what some of Barack Obama’s favorite foods are. Broccoli, he declared recently at a White House Michelle Obama anti-obesity event. His plate is always packed with local, seasonal, organic veggies, most straight from the White House garden. OK, but really, what does he like for a meal? I learned that he loves take-out from Italian Fiesta Pizzeria when he’s in Chicago, and a dinnertime favorite is salmon, any which way. I’ll do it in an Asian-inspired way, making it into a very healthy fish, kale, and rice bowl. I’ll double the garlicky soy lime sauce in the recipe, baking the salmon coated with half, and reserving half for a serve-yourself sauce at the table. I’ll replace the spinach with thinly sliced kale, of course cooking it a bit longer until it’s tender. A side of crunchy pickled turnips would be the perfect accompaniment. Pickling turnips is oh-so-simple, so simple that it has honestly become the go-to turnip use around here. I find them better in their crunchy state, either sliced thinly in salads, or pickled for a great crunchy counterbalance to a warm meal, or as a sandwich filling. The only “process” is soaking the thin slices in salt/sugar/vinegar water – no effort at all. Surely this is a meal that both the President and his healthy conscience (Michelle) could get behind! My baby is turning thirteen! His birthday dinner choice this year is burger and fries – the juicy, saucy, fatty decadent meal that every teenage boy should enjoy to his heart’s content! Those I’ll outsource to a local expert. The extra special addition of sautéed mushrooms will come right from my CSA box. It’s funny how kids hate mushrooms. Until they’re sautéd in lots of garlic and butter. And the only heart-healthy thing on the menu – a kale salad, will be a bit of a twist on the usual. His favorite is a caesar, and the kale from my box wil make an extra special one. For dessert, his very favorite cookies in the “whole wide world,” as he’s said since he was tiny. Alongside birthday boy’s choice of Ben & Jerry’s pints…oh, it’s good to be thirteen! Risotto becomes a healthy weeknight meal with two little tweaks. One, use pearl barley, that is not only nutritionally packed but also delicious. Two, like beets, roast the squash ahead of time – any time you might just be hanging around doing something else for an hour (not even!). And, of course, I’ll use whatever winter squash I have on hand. This week, delicata, which I peel with an carrot type peeler and cut into cubes before roasting for a bit. Delicata is not as thick, so doesn’t take long at all. In this particular dish, you could have the squash completely ready ahead of time to throw in the pot near the end. If you do this, just saute the garlic and sage with the onion (I’ll be using leeks). An amazingly rich and fabulous anytime dinner, on its own, or with the addition of a made-by-someone else roasted chicken. Knowing I’ll have chicken leftovers from last night, I’ll choose a sammie combo that would love a little poultry layered within. I’ll cut the seeded delicata squash (the peel is so delicate, you can even leave on) into half rings, and roast it in a hot oven sprinkled with a bit of olive oil, salt and pepper. Spread any hearty bread with a generous layer of goat cheese (or any cheese! ), layer the squash and sliced chicken in, and pop it in the cast iron. And for my one remaining veggie…parsnip fries, which often find a natural home alongside whatever sammie’s been whipped up that night. Often I’ll do a batch of parsnip fries, plus cook up a bag of frozen sweet potato fries…a great combo for sure! Don’t panic and get out the compost bin if all of the sudden you have a giant veggie delivery coming your way, and you still have a fridge full. Here are a few suggestions for preserving the bounty! (Soups and stews freeze wonderfully in those gallon zip lock freezer bags.